Here’s a strange one for you non-farmers (and hopefully not so strange for you farmers). Lillian is sending Mrs. A.W. a postcard, trying to convince her to go someplace. She’s a bit impatient as she wants to go yet today. Wonder where she wants to go so bad? Lillian goes on to instruct Mrs. A.W. that if she wants to go, to come up after dinner. If not coming, to phone from D. Drakes so she won’t look for her. Lillian writes that because Rosco “thinks he will want to beat his potatoes next week” (more on that later), they’d better go “today”. There’s that word again. The last part of Lillian’s message tells Mrs. A.W. to “get a gait on you” and come. What a quaint phrase. I think it’s comical for Lillian to expect Mrs. A.W. 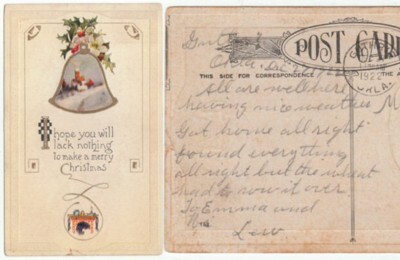 to come “today” when she won’t even get the postcard until after “today”. As for Rosco, I’m not sure what he meant by “beat his potatoes”. We will have to wait to find out as he’s waiting, along with Lillian. Maybe Rosco’s referring to some type of pest control action. I’m pretty sure he’s not referring to mashing potatoes though. If there are any farmers out there, maybe you have some ideas on what he meant. ** If you liked this post and want to share it, please click on the bookmark link to the right.